Parc OL: Les Gones' home celebrates its first birthday. Photo retrospective. 2016 finished on Sunday 31 December. An historic year that saw the birth of Parc OL, the symbol of Olympique Lyonnais' lofty ambitions as well as a multi-purpose precinct capable of hosting the largest of events. See the story in photos. 9 January 2016: a date etched in OL's history. That day, a whole club first saw their new jewel. Parc OL, keenly awaited for several years, was finally born. All the lads, managers, players and supporters turned out for the inauguration of a stadium destined to change the scale of their operations. It was a significant moment that Lyon made even more memorable by beating Troyes 4-1. Alexandre Lacazette will forever be the first scorer there and Bruno Genesio the first coach. It was an unforgettable evening capped off with a DJ set from internationally renowned artist Will.I.Am. But it wasn't only the men's team that set Parc OL alight that season. The OL Women did just as well on the same pitch. After having kicked off their journey in the new setting with a win over Slavia Prague (9-1), Gérard Prêcheur's ladies hosted Paris Saint-Germain in the semi-final of the Women's Champions League. A Franco-French clash that turned into a second show of force by the Lyon ladies (7-0), propelling them decisively towards their third European title. For the last home match of the 2015/2016 season, OL put on an inspired finale against AS Monaco. That fixture would decide who would qualify directly for the following season's Champions League. Lyon won convincingly (6-1) in a party atmosphere. The performance was masterful and the bond with the public absolute. With stars in their eyes, the lads were on their way to the Champions League. The Parc OL isn't solely a football venue. One of the wishes of president Jean-Michel Aulas was to build a stadium that was multifunctional and adaptable, capable of hosting the biggest events. A few months after its opening, the Parc OL played host to the finals of the Champions Cup and the Challenge Cup, the two European rugby competitions. In total, almost 80,000 people were in the stands and barracked Montpellier along in their win over Harlequins (26-19) and Saracens over Racing 92 (21-9). UEFA Euro 2016 was one of the most memorable moments of the year. The tournament, which took place in France from 10 June to 10 July, saw Parc OL host six matches. The greatest players and some of the greatest national teams -including Italy, Portugal (winner of the European Championship for the first time in its history) and Didier Deschamps's France - defended their flags on the Parc OL turf. A party atmosphere had taken hold of the nation and had spread to the stands at the Parc OL, voted the competition's most beautiful stadium. 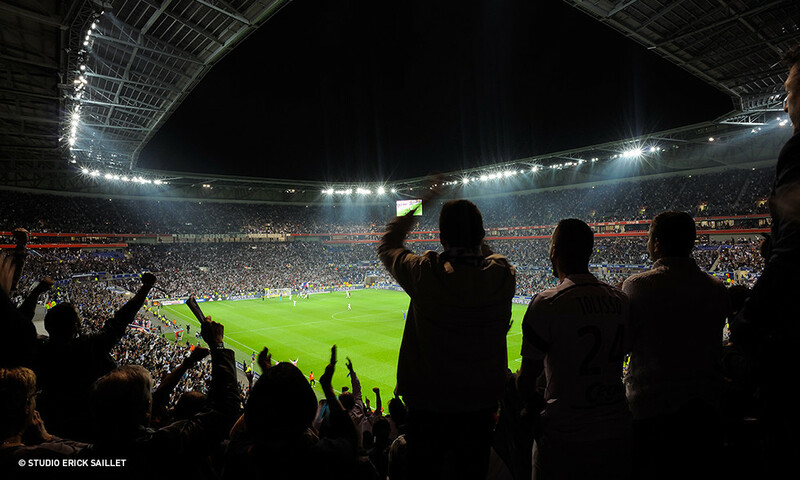 In its first six months, the Parc OL showed its capacity to host major sporting events. On 19 July 2016, the arena showed its full potential in hosting the 'peerless Rihanna', to use the words of Jean-Michel Aulas. The Barbados-born singer, a huge world star, was on stage right in the middle of the Lyon arena for a show worthy of its standing. It was a huge performance and filled with emotion, the artist paying a heartfelt homage to the victims of the terror attack in Nice, which had happened just days before. Without any European matches at the start of 2016, OL played some pre-season friendlies to assess itself against some elite European clubs. It was with this in mind that a match against SL Benfica was organised at the Parc OL just before the resumption of official competitions. With two European Cups and 35 national league titles in the trophy cabinet, the Lisbon club is the most decorated in Portugal and is renowned throughout Europe. At the end of a fiercely fought contest, OL came out 3-2 winners and got their season started at the same time as some of their summer recruits did, such as Emanuel Mammana and Nicolas Nkoulou. Defeats also make history. Like the one against Bordeaux (1-3) in Ligue 1 Week 4, which will remain Les Gones' first reverse at the Parc OL. After a run of 11 matches without defeat in their new home, Lyon finally stumbled. A lacklustre day for Bruno Genesio's players who, despite taking an early lead through Aldo Kalulu, lost their way after Maxime Gonalons was sent off and Alexandre Lacazette was injured. The big day finally arrived. The famous music of the most prestigious of European competitions was finally heard at the Parc OL. Built with the aim of facilitating Lyon's economic and sporting development, the grand stadium witnessed a key moment with the arrival of the Champions League. Dinamo Zagreb turned out be the first opponent that Lyon defeated in that competition on their new turf. The performance lived up to the highest expectations and OL won convincingly (3-0) thanks for goals from Corentin Tolisso, Maxwel Cornet and Jordan Ferri. What better occasion than a derby against Saint-Etienne to break the attendance record? For the very first meeting between the two teams at the Parc OL, a crowd of 57,050 (without a single Saint-Etienne supporter) filled the tiers to cheer their team on. There was a good deal of enthusiasm in the stands - as much as there was tension on the pitch. But Sergi Darder relieved the whole crowd with a header after fantastic work from Nabil Fekir down the right flank, before Rachid Ghezzal sealed the victory in the dying minutes (2-0). Lyon finished their first derby at the Parc OL in the same way as their last at the Stade Gerland: as winners! On the eve of the Festival of Lights, OL were out to light up the Park OL in the lead-up to the most important match of the season. A win by at least two clear goals against FC Sevilla and OL would qualify for the round of 16 in the Champions League. Lyon only needed to convincingly defeat the three-time champions and current three-time Europa League holders. But even though the players fought a fierce battle and gave their all to make it out of the group stage, the posts of the Andalusian side's goal had other plans. Lyon were unable to turn things around (0-0) and found themselves headed for the Europa League. Thus the Parc OL will nonetheless see European competition in 2017. The Parc OL has come of age. After the finals of the Champions Cup and the Challenge Cup in rugby, after concerts from Rihanna, Will.I.Am and Christophe Maé, a final big event came to the multifunctional complex. It was the Winter Game, an encounter between LHC Les Lions and Brûleurs de Loups de Grenoble. A derby between two teams at the top of the Ligue Magnus, it ewent the way of the side from Isère (2-5). Again the stadium showed its capacious ability by beating the French attendance record for an ice hockey match (25,182 spectators). It was a final achievement that saw 2016 off nicely and that bodes well for the future. 2016 is dead, long live 2017!